Ships: 3-5 Days When will this item arrive? 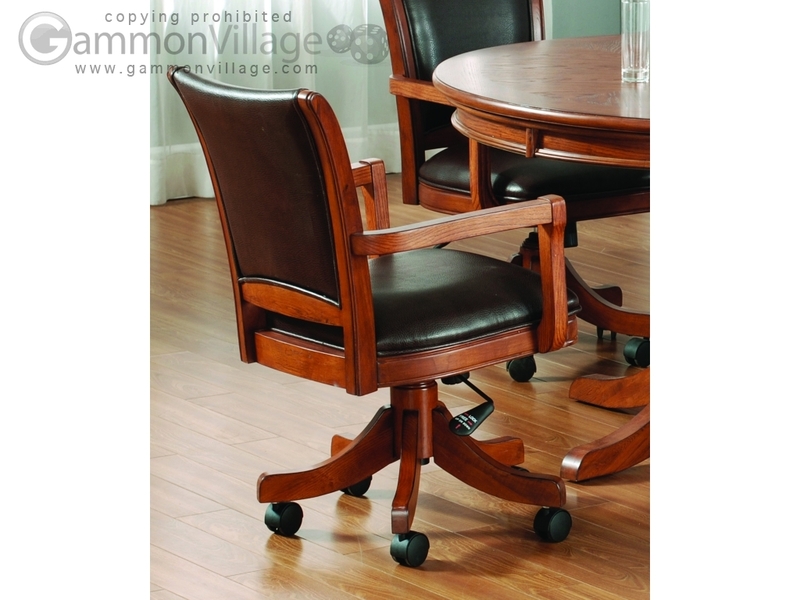 Add traditional charm to your game room with Hillsdale Furniture's Parkview chairs. Finished in a medium brown oak with deep brown leather seat cushions, these chairs combine comfort with casual living and functionality. Composed of solid woods, climate controlled wood composites, and veneers, this chair can find a home in your game room, den, or kitchen. Hillsdale Furniture - outstanding craftsmanship, quality styling, and beautiful finishes at affordable prices. Chair Height: 36" Width: 25" Depth: 24 1/2"
* Seat height adjusts from 18" to 21"
Chair Care: Dust frequently using a clean, specially treated dusting cloth that will attract and hold dust particles. Do not use wax or abrasive cleaners as they may damage the finish. Page P2545 Copyright © 1999-2019 GammonVillage Inc., USA. All rights reserved.